Student Senate held their first State of the Student Address (SSA) in front of a full crowd on Monday, Nov. 19. 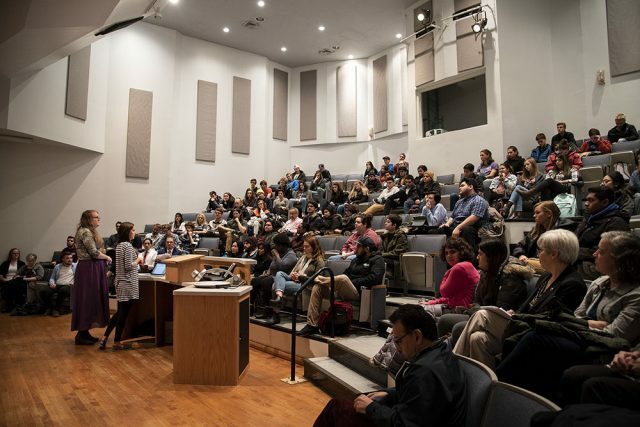 The event, modeled after the Presidential State of the Union Address, served as a way to inform the student body about various projects the group has been working on throughout the semester. “The SSA was made so that the Senate can be transparent in all that we are doing, give updates that students should know about and be a bridge between the administration and the GC community,” said Katja Norton, liaison for student organizations. So far this year, Senate has worked at continuing to connect students with campus administration. To help facilitate this connection during the address, time was given to Goshen College President Rebecca Stoltzfus for her to share her own initiatives with the student body. During the event, student representatives gave updates on their progress in several key initiatives, including disposal of feminine hygiene products, gender inclusive housing and further developing compost initiatives on campus. Norton spoke during the address on how to better dispose of feminine hygiene products on campus. “We took more time to explain this topic during the address to show the process we took to accomplish a student given topic and how the Senate can be of assistance in problems such as this one,” she said. Ultimately, the Senate came to the conclusion that the current method of disposal is already the most environmentally friendly option available. Laura Miller, head of publicity and marketing, spoke on the Gender Inclusive Housing Task-Force. “We anticipate that needs will be met by using one or more floors of the KMY dorms, most likely in Miller, as gender inclusive space,” said Miller. The task force will present a proposal to administration by the end of the semester. Students also had the opportunity to respond at the end of the address. Rowan Miller, Senate Treasurer, hopes that this event can allow students to better understand what the Senate does and how they go about doing it. Stempel shares a similar passion for making positive change on campus. For questions or concerns, student representatives can be reached at senate@goshen.edu.